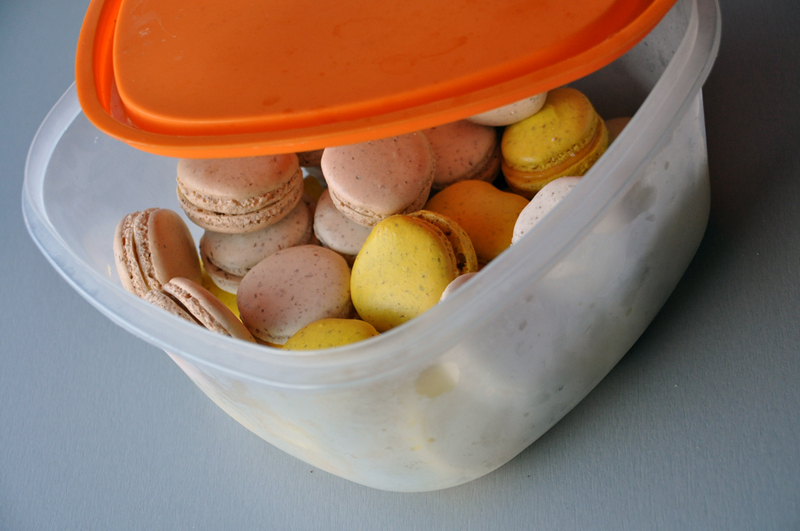 Macarons are best kept in the refrigerator if they are not to be eaten immediately. If they get to stay there for a little while the flavors blends well together as well; the flavor of the filling infuse the macaron shells. I think macarons taste good cold straight from the fridge. If you don’t like the cold flavor, 15 minutes on the kitchen counter do the trick. Macarons can’t remain long in the refrigerator. Two days is often the max, but it depends a little on what kind macarons you have made. The problem is often that they become crispy and dry, but the opposite can happen if you have a wet filling: the macarons turn chewy and sticky. If you are in doubt, a macaron should have a shell that is crispy on the outside and soft on the inside.